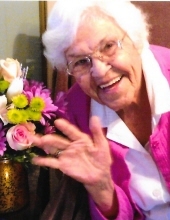 Mrs. Guadalupe Alvarez, of Hereford, Texas, passed away Sunday, April 7th at the age of 91. Guadalupe was born September 4, 1927 in Malaga, New Mexico to Pablo Alvarez and Teresa Saenz Alvarez. The family moved to Hereford in 1980. She remained in Hereford the rest of her life and was a homemaker and loving mother, grandmother, and great-grandmother to her family. She had a ready smile and was always helping in her children’s homes and made the rounds to each of her neighbors to run errands or assist in any way she could throughout her life. Mrs. Alvarez is preceded in death by her parents, her brothers Pablo T. Alvarez I, Cruz T. Alvarez, and Pablo T. Alvarez II, and by a daughter Theresa Quintanilla. She is survived by her brothers Fred T. and wife Olga Alvarez and Edward T. and wife Pam Alvarez, all of Artesia, New Mexico, and by her children Ernestina and husband Frank Ramirez of Hereford, Texas and Linda Boice and Pete Underhill of Anthem, Arizona. Guadalupe leaves behind 10 grandchildren, 29 great-grandchildren, many nieces and nephews, and a host of friends all of whom love and will miss her greatly. Visitation hours 1pm to 8 pm. Celebration of Life service to be held from 6:00 pm to 7:00 pm with Pastor Guy Williams officiating. Prayer service to be held at 10:00 am. Burial to follow at West Park Cemetery. "Email Address" would like to share the life celebration of Guadalupe Alvarez. Click on the "link" to go to share a favorite memory or leave a condolence message for the family.